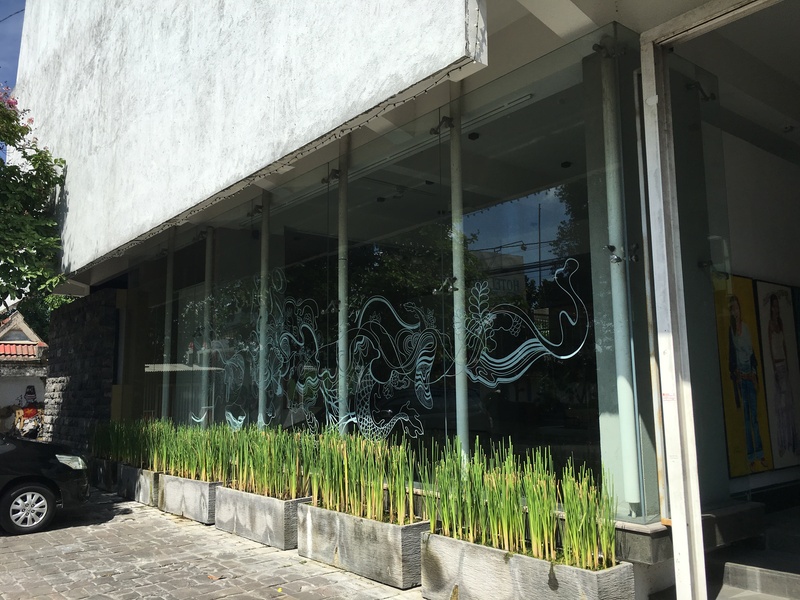 Located in close proximity to other art venues, the Langgeng Art Foundation was one of the spaces on our checklist of places to see contemporary art in Jogjakarta. This foundation was established in 2010 by Deddy Irianto, the founder and manager of Langgeng Gallery, and focuses on providing opportunities for artists and promoting contemporary Indonesian art. As we entered the first floor lobby gallery, we encountered the solo show by Kemalezedine titled Balinese Graphic Art: Drawing and Painting, curated by Rifky Effendy. Although part of Indonesia, Bali stands in stark contrast with the rest of Indonesia in its culture, religion and, of course, art. In this exhibition, Kemalezedine re-examines and re-presents Balinese graphic art. Retaining references to religious figures and paying homage to the intricate craftsmanship of the traditional art forms, he pushes the paradigms of such artistic practices by questioning the place of Balinese art in the contemporary art world. Although originally meant to serve specific religious or cultural purposes, art and architecture in Bali have been exoticised as muses of primordial energy and prelapsarian beauty. Between the modernisation (and perhaps revitalisation?) of Balinese art and the evocation of tradition (albeit somewhat invented or exoticised) lies the interesting but precarious birthing grounds of intriguing Bali-inspired paintings such as Kemalezedine’s. This is also the place where the continually evolving exploration of what Balinese art is would create possibilities for the creation of new works. Leaving the lobby, we descended into Gallery II in the basement, where another solo exhibition was taking place. Gede Mahendra Yasa (Hendra) presents A Study of the Visible, an exhibition curated by Agung Hujatnikajennong. Hendra grew up amidst the rich culture and history of Bali and together with his work and exhibitions overseas, he has grasped a unique understanding of the intersections between modern and tradition; and Western and Asian. In this exhibition, Hendra considers the medium of painting itself. With its long tradition and history, painting bears the burden of representation and with it, the identity of the images it represents. Through his paintings (all of which are oil on canvas), Hendra questions the nature of narrative in painting by stitching fragments and images into a composite whole. In addition, like Kemalezedine, he also questions if a category of Balinese painting exists, and if it does, what it entails. His paintings, most of which bear the title Study #, are inquisitions into the meaning of the visible image in order to uncover the undercurrents of a longstanding medium. From two solo shows, we moved upstairs to Gallery 1 to participate in a conversation between four artists. The exhibition, At the Still Point: Four Painters Making Work, is curated by Tony Godfrey and derives its title from a poem by T.S. Eliot describing the timeless moment when the artist forms the artwork, which rather than created, is actually given and discovered. The four artists, Jumaldi Alfi, Ahmad Zakii Anwar, Jalaini Abu Hassan and Agus Suwage, present paintings, sculptures, drawings and installations which disclose and externalise the concerns of each artist in their art-making. From Suwage’s raw commentary on the animal sacrifices in his belief system, Alfi’s collages referring to the pastiche of image-making in art, Jalaini’s autobiographical drawings, to Ahmad Zakii’s photographic imaginations of a primordial garden, these works invite the viewer into that suspended moment of inspiration and conception of the artwork, and ultimately, to experience that almost-mythical “still point” of artistic production.